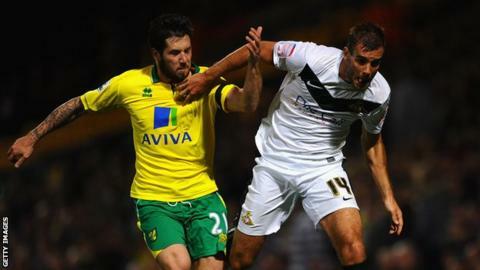 A debut goal for Alex Tettey gave Norwich victory over League One Doncaster to earn the Canaries a home tie with Tottenham in the fourth round of the Capital One Cup. Tettey was handed a start as Chris Hughton made a number of changes. He repaid his manager's faith with a goal after 26 minutes, rifling home with a shot off the post. It is the first time Norwich have reached the last 16 of the League Cup since the 1995-96 season. A minute's silence was held before kick off for former Canaries manager John Bond, who passed away aged 79. The former right-back guided Norwich to Wembley in this competition almost 40 years ago. Norwich, who went into the game without a win in the Premier League so far this season, made a lively start as Harry Kane shot wide shortly before Tettey sent a 25-yard effort just over the bar. Mark Bunn tipped a Robbie Blake shot wide as Doncaster looked to catch out Norwich, but Hughton's side continued to enjoy the better of the early chances as a Kane shot was blocked inside the area. Norwich finally took the lead midway through the first half when Tettey lashed a curling effort from 22 yards that hit the far post before landing in the back of the net. The Canaries pushed forward for a second and Jacob Butterfield, a summer signing from Barnsley, shot from the edge of the area but Doncaster goalkeeper Gary Woods did well to get down and make the save. Doncaster were dangerous on the break and could count themselves unlucky not to have equalised 10 minutes before the half time when Shelton Martis's goalbound effort was blocked inside the area. Woods kept his side in the game with a smart double save in the second half, first parrying Grant Holt's 20-yard effort before getting to Simeon Jackson's follow-up. Holt and Jackson were causing a tiring Doncaster defence problems and the former went close 18 minutes from time with a diving header at the far post. The visitors almost forced extra time when full-back James Husband raced down the left and his low ball into the area was poked towards goal by substitute David Syers, but Bunn gathered the ball to ensure Norwich progressed. Norwich manager Chris Hughton: "We should have had a few more goals, but it is not as if we had clear-cut chances. "At 1-0, they are still in the game, and then it can become a bit tense, so we could have made life easier for ourselves. "It [Tottenham in the next round] will be tough, but it will be a great occasion with a big crowd here. "We won't be favourites, but we will go into the tie doing the best we can to reach the quarter-finals." Doncaster manager Dean Saunders: "We have created 10 chances away from home, and have not scored. The killer instinct was missing. You have to be ruthless in front of goal. I am sick. "I felt we could have won the game tonight because they were not at full strength. "It was an upset waiting to happen. We created the chances, but never took them."